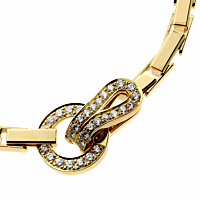 This fabulous, statement-making Cartier Agrafe necklace is set with a round, brilliant-cut diamond hook and loop closure. 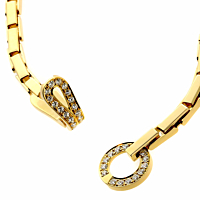 A timeless reputation for authenticity and craftsmanship with unmatched excellence in quality, this Cartier 18k Yellow Gold necklace shines brightly at the collarbone with sophistication. Haute couture inspired in this band of golden elegance of Cartier.